It’s the coziest time of year, and we need something to keep us warm and happy all season long. 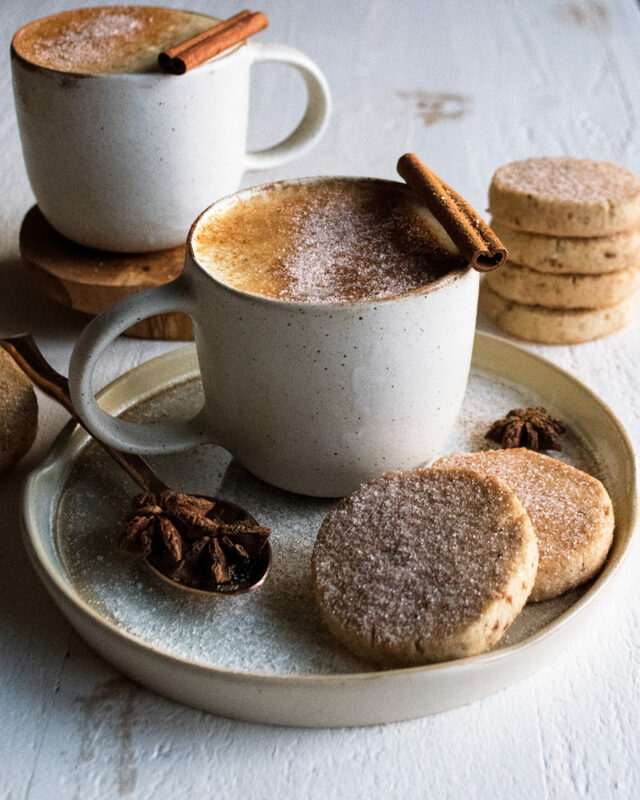 These roasted pumpkin lattes with cinnamon sugar pecan shortbread will do just that! 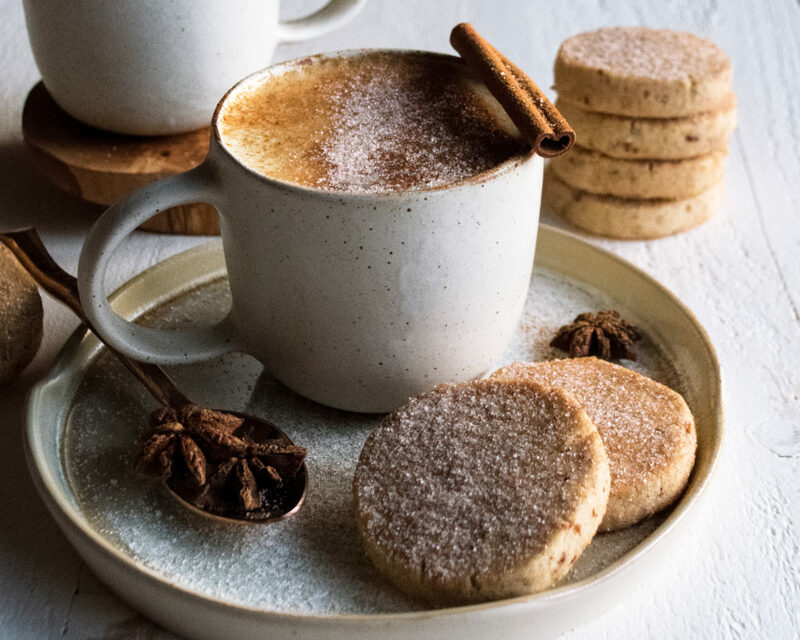 Grab your comfiest blanket and get ready for the best cold-weather plans ever: making cinnamon sugar pecan shortbread cookies while sipping roasted pumpkin lattes, full of warm spice and cozy feels. This is honestly my dream post. I have been wanting to create a latte recipe for so long. I am somewhat obsessed with sipping cozy drinks and basically just doing all the cozy things (I’m sure many of you can agree), so it was time to add a little bit of that coziness to the blog. These roasted pumpkin lattes are simple and pure, unlike a lot of the artificially sweetened versions out there. Plus, it’s just really fun to make this at home. Kind of the perfect excuse to stay in…right?! Start by roasting a whole, fresh pumpkin. You’ll cut it in quarters (be careful doing this because pumpkins are extremely tough) and throw it on a sheet pan with a little oil and salt. Once roasted, the pumpkin flesh will be soft and tender, and will easily scoop right on out. While the cookies bake, you’ll simply puree the squash with spices, maple syrup, and vanilla. This creates the base for the latte. Note: you can actually make this puree in advance and just store it in the fridge for latte-making at a moment’s notice! Next up, you’ll heat some milk with more sweet flavor and then blend it with the puree until frothy. No special equipment required, just a good high-powered blender to create a really smooth drink. This warm pumpkin milk mixture (which is oddly so good on its own..) gets poured right over a couple of shots of espresso. If you don’t have the ability to make espresso at home, you can go to a coffee shop and simply ask for a few shots of espresso. Or, brew some coffee and just use that! 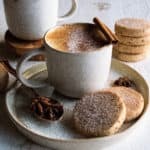 Finally, bundle up and enjoy these warm roasted pumpkin lattes with the cinnamon sugar pecan shortbread on the side (or dipped in!). 1. Combine the softened butter and sugar in the bowl of a stand mixer fitted with a paddle attachment. Cream the butter and sugar until smooth and fluffy, about 3 minutes. 2. In a separate bowl, sift together the flour, cinnamon, and salt. Gradually add the dry ingredients to the butter, mixing on low until incorporated. Use a rubber spatula to scrape down the sides of the bowl as needed. Lastly, mix in the pecans. 3. The dough will be somewhat crumbly. Use your hands to transfer it to a clean surface. Form it tightly into a ball, and then begin to form it into a log (about 2 inches in diameter). Use a piece of plastic wrap to continue to help tightly shape it into a log, while also wrapping it up. Chill the dough for 30 minutes. 4. Meanwhile, preheat the oven to 350F. Combine the remaining sugar and cinnamon and set aside. 5. Once the dough has chilled, unwrap it and use a serrated knife to gently cut the dough into ¼-inch cookies. Roll each cookie in the cinnamon sugar to evenly coat it on all sides. Place the cookies on a baking sheet, about ½” apart. 6. Bake the cookies for 12 minutes. Remove the cookies from the oven, sprinkle with more cinnamon sugar, and let cool. 1. Preheat the oven to 375F. Carefully cut the pumpkin into quarters, leaving the skin on. Remove the seeds. Coat the pumpkin with a light coating of oil on all sides. Place it on a baking sheet and season with a pinch of salt. 2. Roast the pumpkin for about 45 minutes, or until tender. Let the pumpkin cool slightly. Scoop out the flesh and discard the skins. 3. Add the pumpkin flesh (you want about 1 ½ lbs) to a food processor, along with the hot water, maple syrup, vanilla, cinnamon, nutmeg, and cloves. Process until smooth. 4. Use immediately or reserve in the fridge, tightly covered, for 5 days. 1. To make four lattes, combine the whole milk, 1 cup of pumpkin puree, and star anise in a small saucepan over medium-low heat. Whisk until smooth. 2. Gently bring the mixture to a simmer. Lower the heat fully and let cook for 2-3 minutes. Remove the star anise. 3. Transfer the mixture to a blender, along with the maple syrup. Blend on high until smooth and foamy, just about 30 seconds. 4. Pour the hot espresso into 4 mugs. Pour the pumpkin milk mixture right over top. 5. Lightly sprinkle each latte with cinnamon and a pinch of the cinnamon sugar mixture from the shortbread (optional). Serve the lattes with the shortbread. 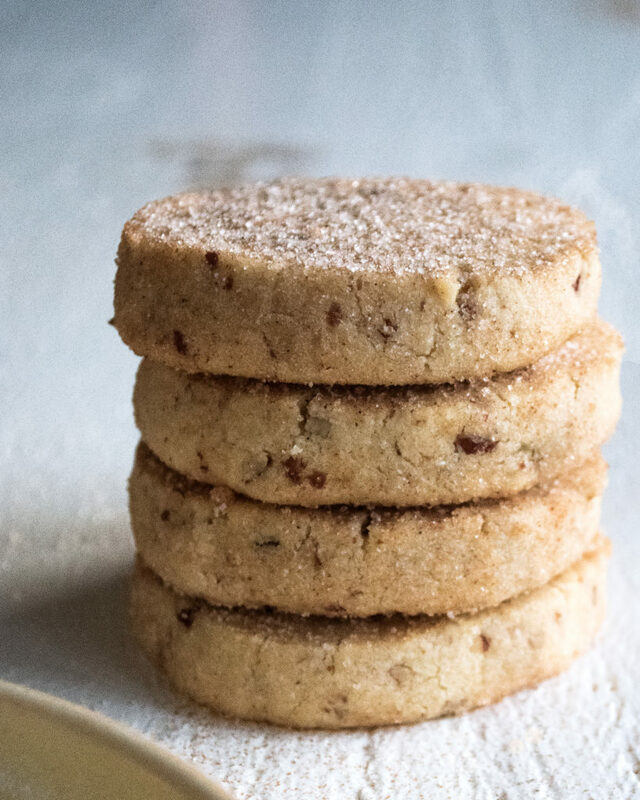 The cinnamon sugar shortbread will make approximately 24 cookies. The roasted pumpkin puree makes enough for about 12 lattes. The latte recipe makes 4 lattes, but can easily be doubled or tripled if serving many people at once. Store any remaining pumpkin puree in the fridge, tightly sealed, for making lattes another day (keeps for up to 5 days).